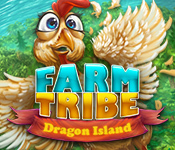 Farm Tribe: Dragon Island is rated 3.5 out of 5 by 22. Rated 5 out of 5 by Jazzi98 from Enjoyable and relaxing I have been playing this game for over a week and still loving it. You plant crops, make things, either sell them or complete quests, and use the coin to hire more workers, buy more equipment, or expand your farm. While the game probably isn't endless, it seems that way right now. I've completed most of one questline, and there is still another questline to unlock. Once the quests are all complete, there is still a market to sell your goods, so you could potentially play the same game forever. The crops and goods themselves are pretty quick to complete. I have everything unlocked and the longest production timer is 3 minutes, with nearly everything being less than that. (There are some special items that take up to 15 minutes, but these can be built up before you get the quest to use them). This is one of the best farming games I've ever played. Rated 5 out of 5 by lininindy from FUN, RELAXING, OR CHALLENGING... This game really suits my moods! I can be challenged and try to do things quickly or I can be relaxed and while away the time. I'm excited to see this game come out. Rated 5 out of 5 by sugartoes43 from Happy Farmimg Great Farming game enjoyed it for hours. Rated 5 out of 5 by SilverCat463 from Finally, a farm game with short times I really love this game. I purchased it after playing for only 15 minutes. One of the things that I really dislike about a lot of these games are the wait times for crops and buildings. This is a dream come true. Crops take only seconds to grow. Building take only a couple of minutes to complete. I am on level 15 and have advanced to the point of having 6 different crops. The newest crop takes under 2 minutes to grow. I find the story line interesting and though it requires that you create items, it doesn't take very long to collect the things you need for the next step. I have not played the first Farm Tribe game, so I downloaded it and started it. Did not like it at all. It is very much like the virtual villagers. Do not let that stop you from trying this game because it is very different from the first game. I like the fact that you do not need to 'drop' your worker onto a factory, he automatically goes where he is needed. There is no problem when you assign more work than you have workers for, because they finish what they are doing and go to the next job seamlessly. The only thing I have found that could be considered a problem, is that some of the quests require multiple steps and it is not obvious. So you gather everything needed, collect your item and then it asks for it all over again. Huh, I just did that... So I think I missed where its multi-step or it is not marked as such. Not really a problem. I am far from done with this game and you can tell I'm excited about a farm game where I don't have to go away for hours to wait for things to finish up. I highly recommend this game! Rated 5 out of 5 by nmgirl98 from Farm Tribe Part 3 If you played the last 2 Farm Tribes, this one is going to be much different. Your goals/challenges come from other villages across the river. 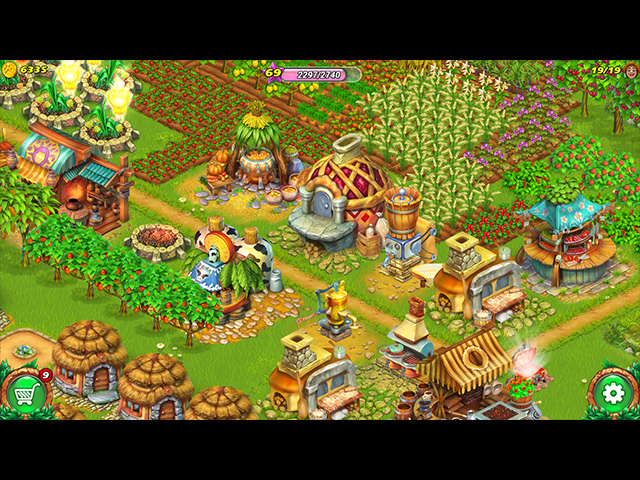 From playing the demo, food production and other tasks are relatively quick. Of course that could change as things progress. Scanning around your island is a good thing as treasure chests pop up, as do the gophers. The pace is what you want it to be - there aren't timed challenges or any levels...you just roll along. Graphics are good - keep your eye on the chickens when you don't feed them :) Overall, fun, relaxing game. Rated 5 out of 5 by joybelle_1 from Relaxing, time wasting fun. Once I got over my surprise at how different this is to other games of the same name, I am really enjoying it. It is a bit tedious getting started but that is your learning tool. The similiarity to past games is that you must set up and run a farm requiring the acquisition of workers, buildings, and stock. 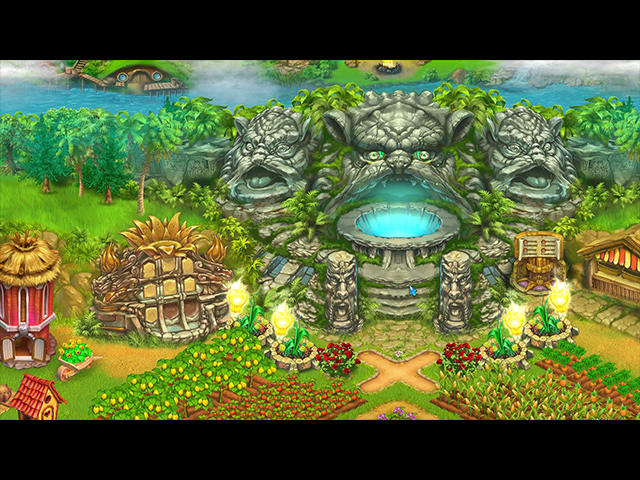 The difference is that whilst you will still be running your farm, your quests and requests will come from a mystical island across the sea which you can travel to freely. From these you earn you rewards such as new buildings, plants and abilities. Leveling up for other rewards are earned by producing and selling on your own farm The graphics are cheerful and friendly, and there is absolutely no time pressure. Love that. There are magic chests that appear and also give you tokens, and the odd mole who needs whacking on the head. It is an adaption from the phone market, with only one profile, but once you finish you can reset to play again. Many tasks require you to reach a level ahead, so its obviously got longevity of play when you explore the levels you need and the size of the game screen. Many and much! Its not a game of excitement, but a thoroughly enjoyable time waster. There are also achievements to collect as you proceed. This game is eye pleasing, relaxing and good value. Love it.